DC Mayor Vincent Gray (D) on Monday will meet with members of the Deanwood Citizens Association who are outraged over the shooting death of Akinwole Olu Williams, 31, killed on Thursday of last week, near midnight, while walking the short distance from the Deanwood Metro Station to his home. Doxie McCoy, a spokesperson for the mayor’s office, on Saturday, said prior to Williams’ murder, the mayor was engaged with the Deanwood Citizens Association and was scheduled to meet with the residents of that community the week prior, but was forced to postpone. “So his visit was not prompted by murder [as indicated in the headline of an earlier report], though it is certain to come up,” said McCoy. Deanwood representatives agree that they had been reaching out to the mayor for some time and fully expected the mayor to make time for them, as recently as the postponed meeting last week, and believe the Williams murder has indeed pressurized the situation. “But [the murder of Mr. Williams] was not the initial driver of our desire to meet with the mayor, who clearly wants to meet with us, but we do not expect a postponement this week,” said one concerned Deanwood property owner, on Saturday. “…Certainly he wants to be responsive to urgent community concerns about murder, other crime and whatever other issues residents want to address. So he looks forward to the dialogue,” added McCoy on Sunday. Violent crimes have rocked this community, including the murder of Williams, who recently completed his bachelor’s degree studies at Catholic University, was considering law school and, meanwhile, worked at Comfort One Shoes, near Dupont Circle in NW DC. On the night of his brutal slaying, Williams decided not to wait for his usual ride home from his brother (also his roommate) who was delayed at his job. He caught the Metro train home and was killed, by a still-unknown assailant by a shotgun blast to the chest, just steps from his apartment in the 1000 block of 44th Street NE, near I-295. Deanwood community activists have secured a commitment from Gray to meet with them on Monday (March 25, at 6:30 p.m.) at the Deanwood Recreation Center at 1350 49th Street, NE to discuss the violence in that community and conditions which they believe are untenable to the peace and stability of the neighborhood. “We want more police patrols, new bright lighting, clean streets and enforcement of housing codes to eliminate dilapidated, vacant homes,” said another Deanwood property owner, on Friday. Sources say, Ward 7 DC Councilmember Yvette Alexander (D) is also expected to attend the Monday meeting. 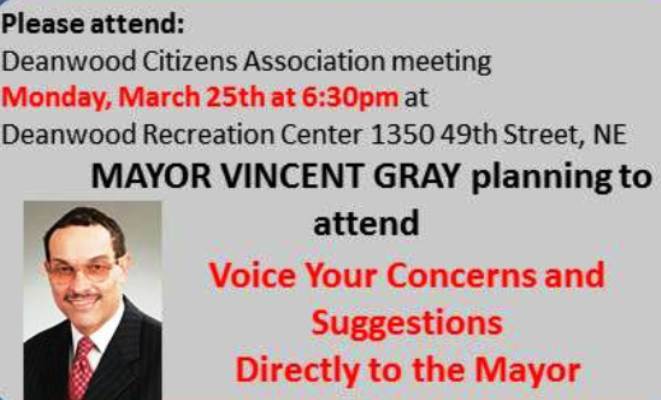 Note: For more information about the Monday meeting in Deanwood with Mayor Gray, contact Adrienne Loftin at 301-706-9390. This entry was posted in 2nd Amendment, Gun Control, Gun Rights, Jesus, Media, NRA, Politics, Second Amendment, Spirituality and tagged Akinwole Olu Williams, Deanwood Citizens Association, NRA, Second Amendment, Vincent Gray. Bookmark the permalink.